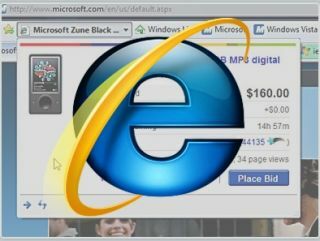 So when might IE make it back into Windows in the EU? Isn't it a bit late to be making changes to Windows 7? Does Microsoft have a death wish? Fresh from unveiling some of the most gruesome financial results in the tech industry's history, it seems as if the far-too-confusing EU launch of Windows 7 is about to get even more complicated. Remember the browser-free version it was planning to ship? Well, you can forget about that now. Or maybe you can't. when the final version ships. Having to do a clean install isn't just a pain for punters. It's a pain for PC firms, too, because canny customers aren't going to buy a PC now just to reformat the whole thing in a few months. Perhaps that's why PC firms aren't exactly trumpeting Windows 7 on their UK and EU websites. With Windows 7 released to manufacturing, browser-free versions are making their way onto European PCs right now - but at some unspecified point in the future, Windows 7 might include a browser after all. That might happen before the official launch date, giving PC firms another pain in the neck, or it might happen afterwards, giving everybody a pain in the neck. The official word from Microsoft is that it's proposed putting the browser back into Windows (along with rival browsers), but that it won't actually happen "until such time that the Commission fully reviews our proposals and determines whether they satisfy our obligations under European law." The EC isn't the fastest organisation in the world, so the timing is rotten: unless the proposal has been kicking around for months and the EC's only just got round to opening the letter, it seems rather silly to wait until you've started manufacturing install DVDs before deciding that a browser-free Windows is a donkey. It's the tech equivalent of getting married, climbing into the marital bed on your wedding night and telling your partner: "I've just realised something. You're a minger! God, I wished I'd noticed that earlier!" We understand that Microsoft has to keep the EC happy, but this is a mess. Windows 7 is Microsoft's chance to redeem itself after the botched launch of Vista - which, these days, is a perfectly decent operating system with a terrible reputation. Windows 7 is an even better operating system, but who's going to buy it when even Microsoft reckons the shipping version is a duffer?